Gamma-ray Space Telescope where they were observed. The Fermi Gamma-ray Space Telescope is an Earth-orbiting space observatory that is being used to perform high-energy gamma-ray astronomy. Launched in June of 2008, this telescope is probing the cosmos for gamma rays and high-energy events. And while it is finding many sources for these events, such as supernova explosions and distant, supermassive black holes from other galaxies, it has also found an unlikely source closer to home. In 2009, the telescope was hit by a stream of high-energy positrons—the antimatter version of electrons—coming from a thunderstorm on Earth. 100 trillion positrons had been funneled into a tight pulse by the Earth’s magnetic field and hurled straight to the observatory at nearly the speed of light. To put that number into perspective, it’s more than what hits the Earth’s atmosphere from all other cosmic sources combined. Somehow, antimatter had been produced in the clouds above Earth and the best theory we have to explain it is dark lightning. 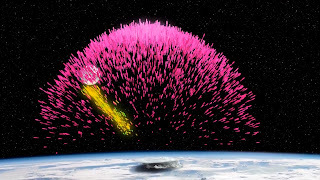 Earth-orbiting satellites have been observing terrestrial gamma ray flashes (TGFs) from thunderstorms as far back as 1994. And it is also known that gamma-rays at the right energy can produce electron-positron pairs. Normal lightning occurs when unbalanced electrostatic charges in the atmosphere trigger a massive discharge between a cloud and the ground or between two clouds. A light flash traces the path of the charged particles which heat the air to 30,000°C, nearly six times hotter than the surface of the Sun. 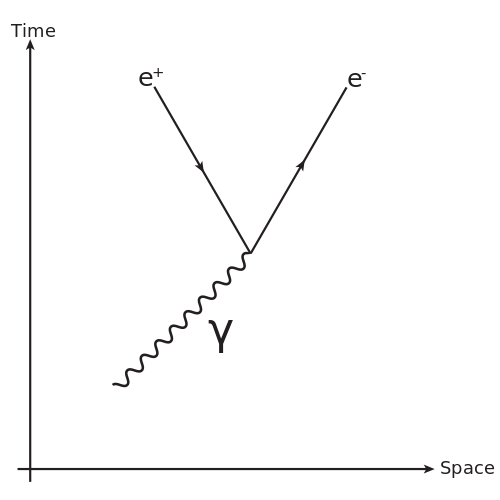 decaying into an electron-positron pair. Dark lighting may seem crazy, but there is mounting evidence that it’s real. Like ordinary lightning, dark lightning also tries to neutralize the unbalanced electric fields in a thunderstorm. Under the right conditions, the thunderstorm creates a powerful avalanche of electrons shooting away from Earth at nearly the speed of light. The electrons collide with air molecules in the atmosphere to produce gamma rays. 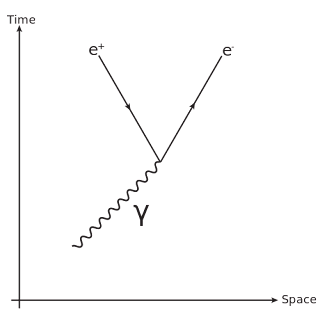 Next, the gamma ray energy transforms into electron-positron particle pairs. Further collisions between these particles and other air molecules creates a repeating cycle—a self-generating, self-sustaining particle accelerator. Once the loop gets started, it can discharge the thundercloud as fast as lightning. And because the cascading electrons and positrons generate more gamma rays than visible light, the process is practically invisible to the human eye. Researchers once thought the gamma ray flashes from thunderstorms were a weird by-product of ordinary lightning. Now many think it is dark lightning instead. The gamma ray burst monitor onboard the Fermi Gamma-ray Space Telescope is perfectly suited to record these flashes and new data processing techniques have improved the burst monitor’s performance. In mid-2010, a testing a mode was initiated which allows for the detection of faint gamma ray flashes that had previously gone undetected. Now Fermi should be able to catch nearly 1,000 flashes each year. With an abundance of new data, researches hope to gain new insights on the mysteries of dark lightning.